I do want to talk here about what a next Rochester might look like, and how the city might be transformed into a useable, durable, and sustainable urbanism to serve its future. I intuit that this shrunken city (population of 332,500 at its peak in 1950, about 219,000 today – a reduction of slightly more than a third) and its sprawling, auto-dominated region of about 1.2 million faces some pretty staggering challenges ahead. But before that conversation can begin, its back to urban basics. The simplest and surest way to get to know any city is to take time to understand its streets and blocks. I am embarked on that task here, in our new home place. The oldest and central part of the city, downtown, is sufficiently aged, and has been sufficiently cut up, moated by the laughable Inner Loop, ravaged by horrific 20th century modernism, and assaulted by surface parking lots, that if there is a useful pattern to the streets here, it is not discernible. 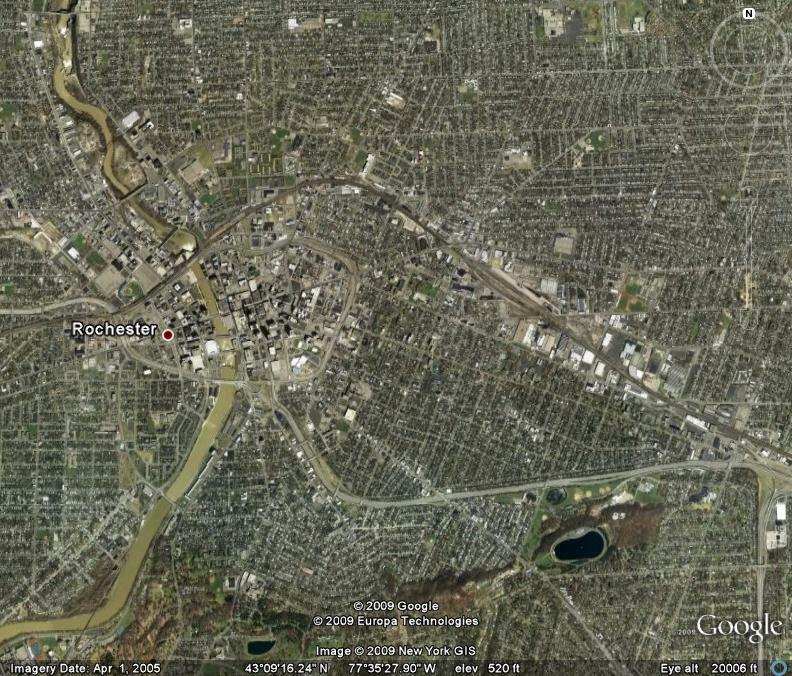 Downtown Rochester from 10,000 feet. Google Earth. But if one sifts through the archives a bit, some patterns do emerge. Once, most of the city’s diagonal streets converged on downtown. I noticed this clearly when I found an old street map from 1912, above, and another from 1955 – before the Inner Loop – below. 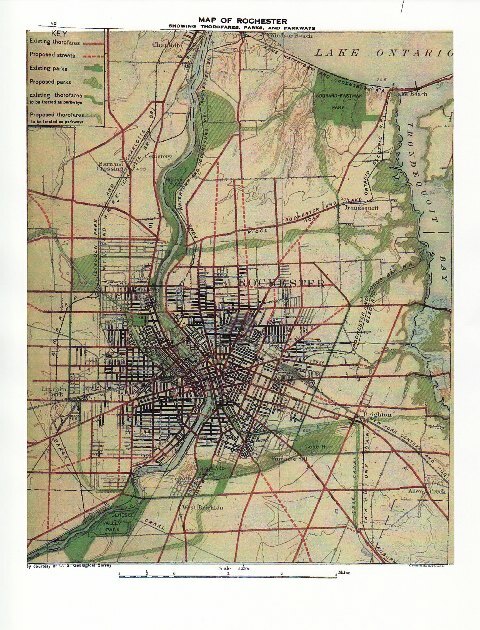 1955 map of downtown Rochester. Downtown was a nexus of converging diagonals – Monroe, East, St. Paul, South, North, Clinton, and of course, Main, among others. This convergence corresponds nicely with the Genesee River waterfalls: these falls were the central point of Rochester’s beginning. It was here, in 1789, that Ebenezer “Indian” Allen built the first grist mill (Rochester’s nickname was The Flour City, though now it has become the Flower City – lilacs), and a tiny enclave of outbuildings. The population in 1790 was only about 25 souls, and the mill didn’t stay in operation for long, but the city had been born. 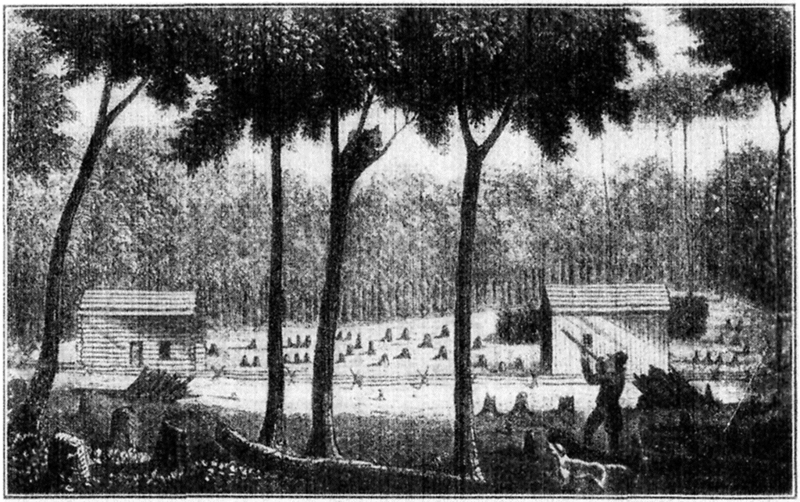 Allen’s mill, on the banks of the Genesee, in 1789. By 1800 the land had passed into the hands of Colonel Nathaniel Rochester. Rochester moved his family to the area in 1808, and began surveying his 100 acre tract, and creating parcels for sale, in 1811. His basic unit of property was a quarter acre lot – a size that sounds familiar to us even today. 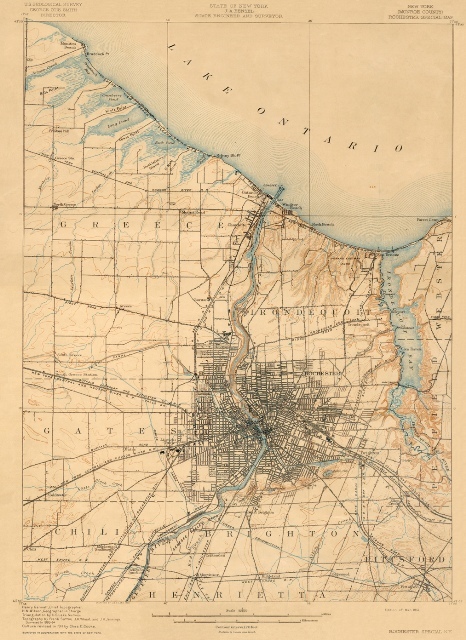 A few years later, in 1823, the Erie Canal arrived, followed shortly by the railroads, and the little village blossomed into a full-fledged city – more than 20,000 people by 1840, almost 5 times the population of Chicago at that time. 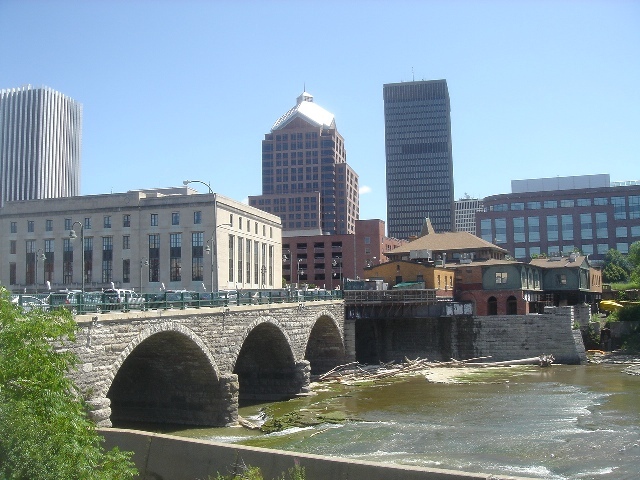 By 1900, Rochester was the 24th largest city in the entire country. 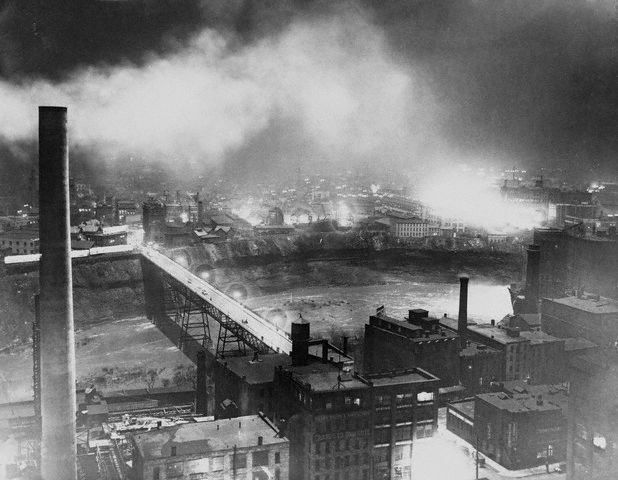 Rochester and the falls at night, 1925. Busy streets of a buzzing city divide the land into blocks, our next subject of inquiry. 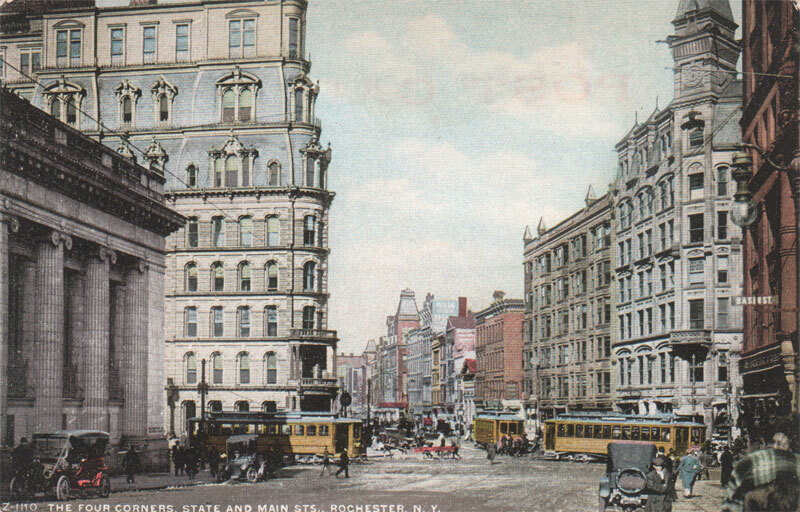 Rochester is a city with few repeating patterns in its street and block forms. The roads and resulting blocks seem to go every which way. Part of this perception is a result of my upbringing, in the rigidly gridded fabric of Chicago. When Col. Rochester undertook his parcelization in 1811, his blocks were rectangular, as was the custom of the day. 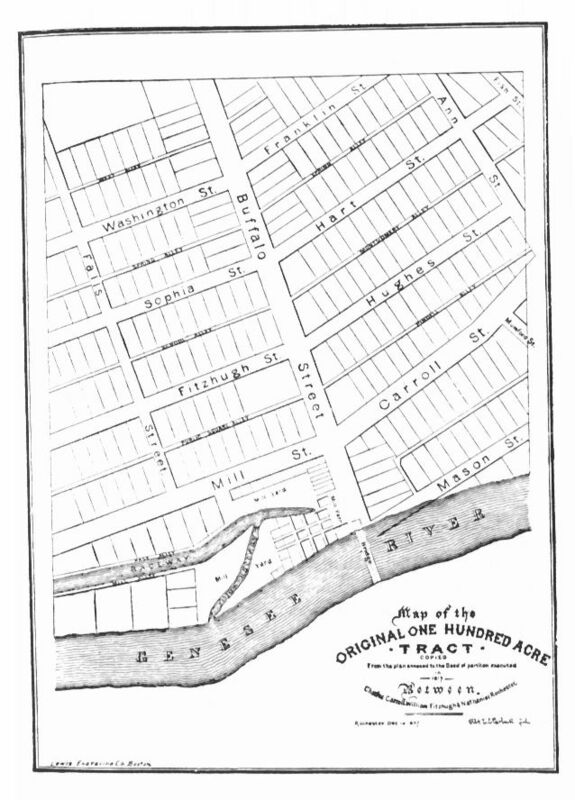 By 1817, the city’s blocks were laid out as shown in the image below. North is to the right on this map. If you look closely, you can see that the alleys, as well as the streets, have names. I would love to say that alleys are a feature of most Rochester blocks, but alleys are decidedly not a feature of most Rochester blocks. In fact, there are very few alleys in this town, but when you can find one, it usually does have a name. Haags Alley, Parker Alley, Jordan Alley. Most of the oldest blocks with alleyways were in the central city, and were blown up in the quest for the Inner Loop. Harrumph. (No alleys means that increasing the Rochester urban density, which I believe all cities must do in order to become sustainable, will be more difficult than if alleys were present. In Rochester, alley housing, or as the Canadians more delicately call it, laneway housing, will be hard to achieve. But more about that later – let’s stick to basics). By 1820, the city looked like a burgeoning hamlet. The map from 1820, below, seems a bit optimistic – is this a marketing brochure? – since the population was only 1,502. The streets and rectangular blocks are oriented by the river, and the alleys persist. By 1827, as the city’s population neared 9,000, the basic orientation of streets and blocks was quite well established. The grid of blocks and streets east of the river has pivoted to a northeast and southwest orientation, with East Avenue as its main east-west drag. East Avenue is the street that joins Main and Franklin at the little triangular urban space in the right center of the map. 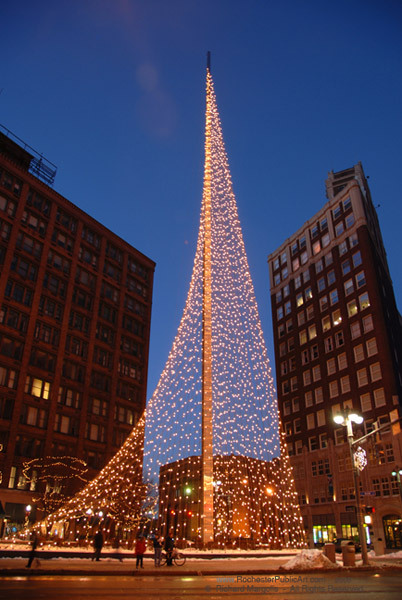 This little triangle would eventually become home to the Liberty Pole, which today is lighted during the holiday season. We went to the lighting ceremony this year. The city hopes every year that the ceremony, with its parade and bands and ice skating and general hoo-ha, will bring lots of folks downtown. This year there were probably 300 people in attendance. Oh well. Parenthetically, (this whole post is parenthetical) the Liberty Pole at this intersection has a deep history. The first one was erected in 1846 by the East Side Boys, a political club. It lasted until a storm in 1859. It was replaced, in 1861, by the version below. This version lasted until 1889, when it was felled in a storm. 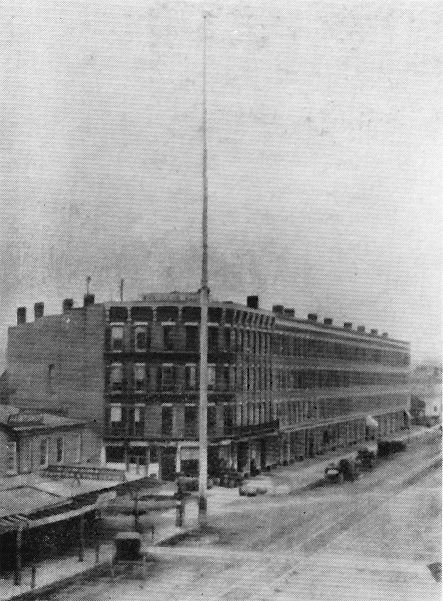 Then it was 75 years until James Johnson would create the Liberty Pole we have today. Anyway, that’s the intersection of Franklin, East and Main. Back to the blocks. As I was musing, the 1827 plat shows that most of the basic orientation of the blocks was established at a very early moment in the city’s history. South of the third ward, a north/south orientation arises, and in the fifth ward as well. 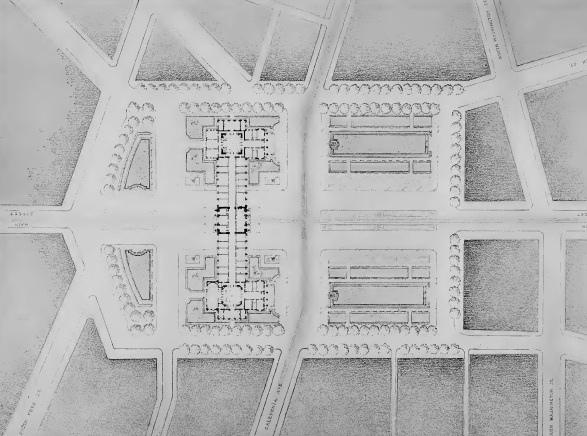 The orientations of 180 years ago would establish the basic urban kit of parts for the city for generations to come. 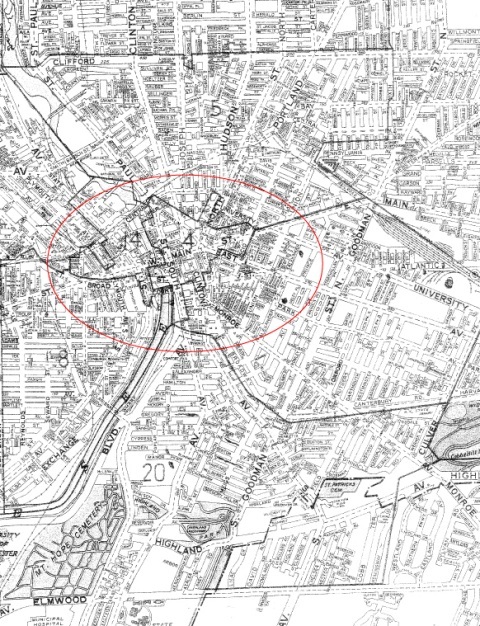 Consulting Rochester maps from the later 19th and early 20th century testifies to the fact that the basic approach to city making here was pretty well established before 1830. Outside of downtown, the city is, except for a handful of older commercial corridors, principally characterized by single-family residential neighborhoods. As a result the blocks are not very deep, with two homes back to back at between 230 feet and 300 feet or so. While the blocks are not very deep (no alleys, alas), they can often be quite long. Once you have understood the basics of block depth, which may be called the warp, the woof of block length just seems to go on. It’s quite common to find 1,000 foot long blocks here. Not really conducive to mixed use, walkable neighborhoods, I’m afraid. We need mid-block snickets, or cut-throughs, so walkers can move about easily. Walkers. In Rochester, most neighborhoods were not created with walking in mind. There are a couple of exceptions, but our new neighborhood scores only a 46 at www.walkscore.com. Rats! – in DC we were a 91, and in Chicago we were a 94. Get in the car, I guess. So. A brief look at streets and blocks in Rochester. I am learning how the city came to be the way it is. Next up, I need to think about what happened here after the city reached its peak population of about 333,000, in 1950, and it began to move from 32nd largest city in the nation to today, when it is the 99th largest city in the country. More work ahead. Rochesterians – what have I missed? Or screwed up? Onward. Cars are everywhere. Shopping is at one of the four major malls, out in the suburbs – there’s almost no retail left downtown. There’s an inner and an outer loop of expressways that act like walls to the now forbidden city. All that’s left of public transit is a bus system, and here in Rochester it is impossible, unbelievably, to get a single system-wide map. You know what this all feels like – everywhere U.S.A.
Not so oddly, it wasn’t always so. 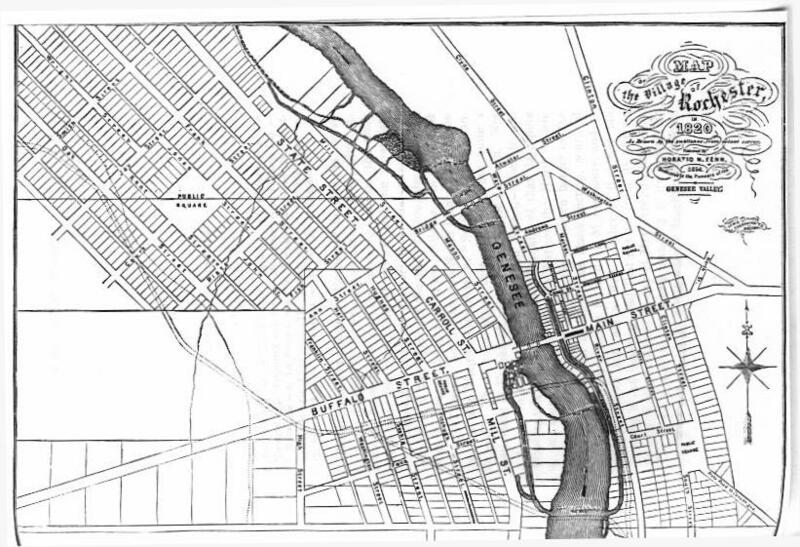 Rochester once had all of the buzz, and commerce and mobility, of the Erie Canal. And a huge amount of rail service – freight, passenger, short haul and long, interurbans to Buffalo and Syracuse and beyond, and of course, the ubiquitous streetcar, complete with a line to the amuseument park in Charlotte, on the shore of Lake Ontario. A truly intermodal city. And a handsome one, at that. 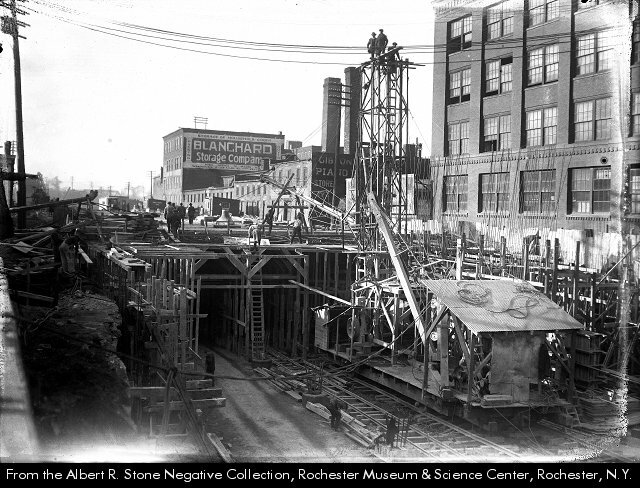 Rochester even had a subway, shown below during construction. The subway opened in 1927, and ran beneath the city until 1956. The alignment map shows a system oriented northwest to southeast. There were connections available to a number of surface rail systems – streetcar lines, interurbans, and longer range rail lines. It must have been pretty easy to move around the region in those days. The line ran only about 2 miles in tunnels – the rest was grade-separated in a cut, most of which, before 1918, was the old Erie Canal. 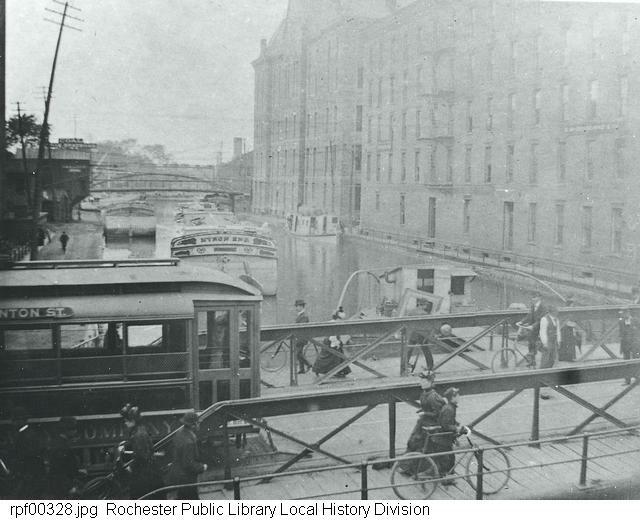 The Erie canal was relocated and became the Erie Barge Canal in about 1918, and the old canal bed was set for its next incarnation – rail transit. Of course in its current incarnation, much of the canal has become home to the expressways of today – such is progress. 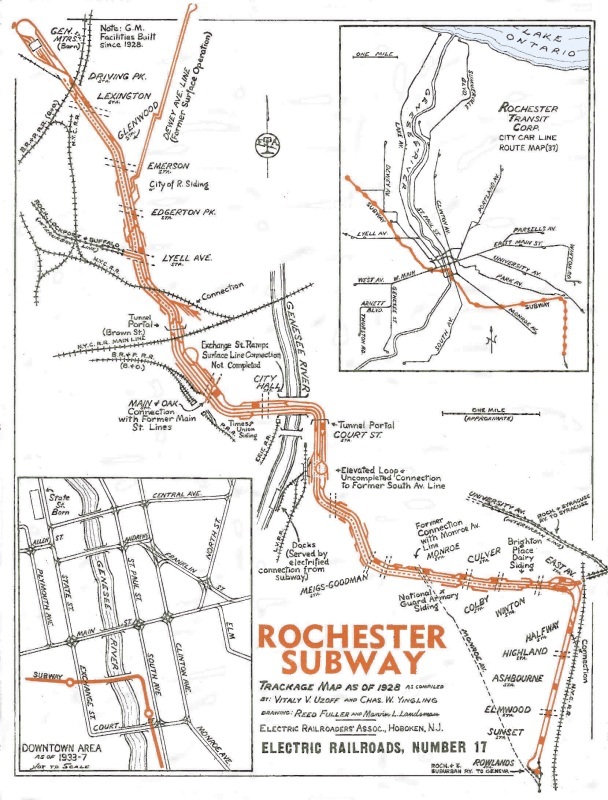 Rochester was reputed to be the smallest city in the world with a subway system. And interestingly, much of the old downtown subway tunnel remains mostly intact. In fact, it has become the center of a protracted debate about the need for renewed public transit access, public safety (the tunnels are often used as shelter for the homeless), and public fiduciary responsiblity (the city pays something north of $1.2m annually to maintain the tunnel). The city has been trying for years to fill the tunnels in, and transit advocates have kept this from happening. 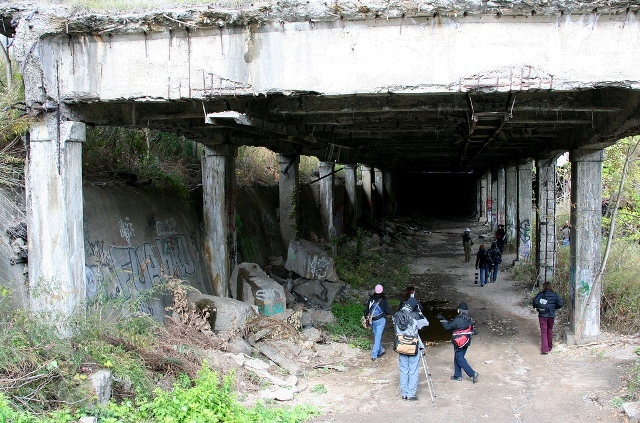 It looks at this point as if the advocates are finally going to lose – the tunnels are slated to be filled in the spring of 2010. As a local urbanist said recently, unearthing them later is not an overwhelming task. We shall see. And of course Rochester is blessed with more than its fair share of transit geeks (I count myself as one of these, by the way). 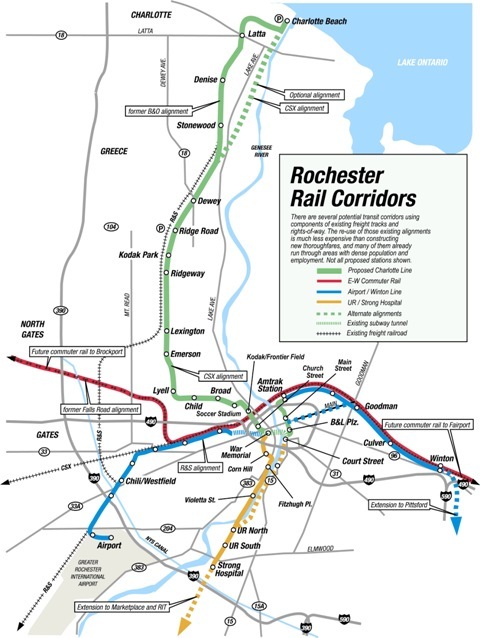 One of the groups, the Rochester Rail Transit Committee, is outspokenly advocating a revival of regional rail transit. They have even created their own system map. 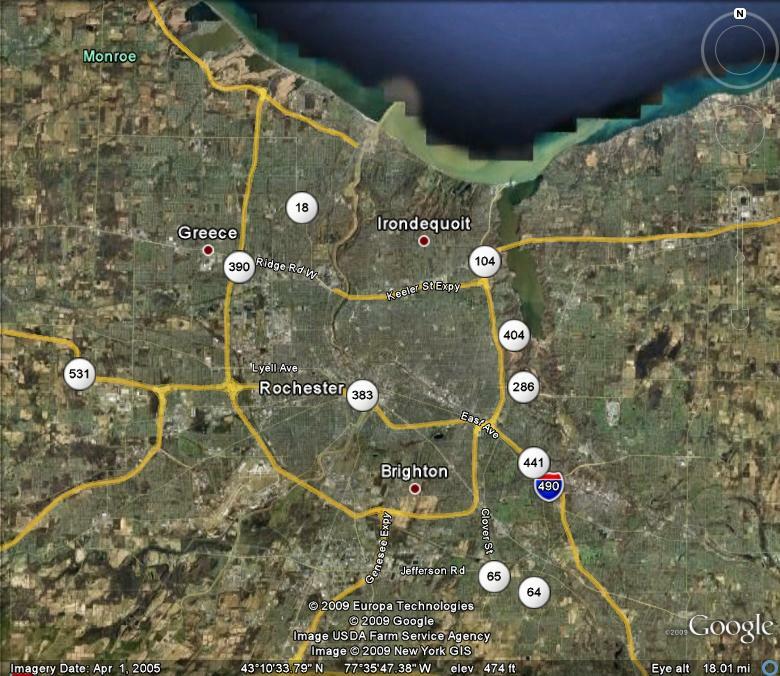 The proposed system connects most of the region of now about 1.2 million – spread out all over the place – connects the airport to the rest of the city, gets down to the University of Rochester, the region’s single largest employer (Wegmans, the grocer, is second largest, and Kodak now a distant third), and hooks up the High Falls and the river downtown to Charlotte and the Lake Ontario beaches to the north. Oh, and reuses the old subway tunnel. Not a bad piece of work, really. The four cardinal shopping malls aren’t part of the system – they aren’t really sustainable for too much longer anyway – but the baseball stadium AND the soccer stadium are on the green line. And so, like many other American cities, an unsustainable auto-dominated present is built upon the foundations of a past which featured a rich array of mobility assets. It’s quite a document – vintage City Beautiful Movement in text, designs, and recommendations. I decided this afternoon to undertake a bit of a “then-and-now” comparison to examine what they suggested and what is actually in place today. You can find the whole book online if you’re interested. The plan view is an interesting piece of urban design, weaving building and streetways together: the Civic Center is placed astride Main Street, with roadways and trolley running through the building, which then enfronts a pair of large civic open spaces. 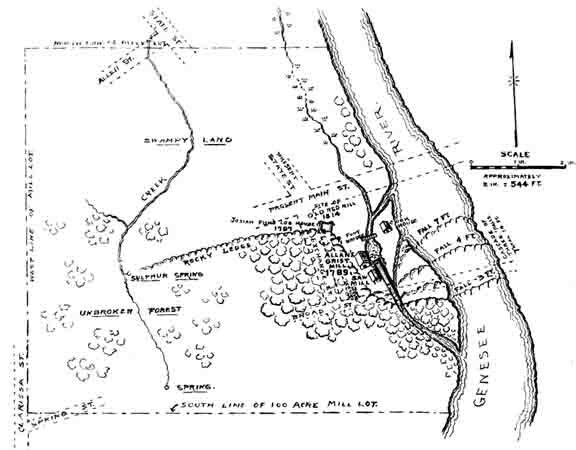 North is at the top in this drawing from the Plan, below. And here is what this site looks like today. That’s W. Main Street running left to right (east and west) in the middle of the photo. 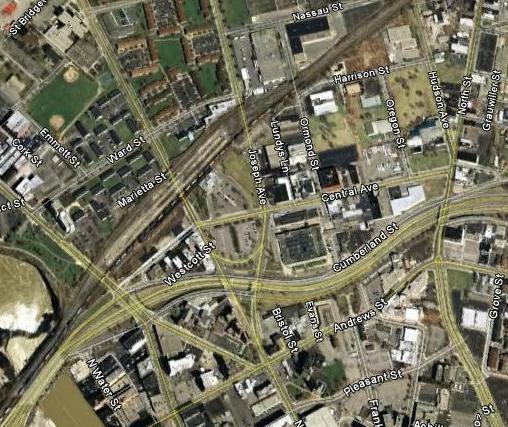 The Civic Center would have run from the 490 Inner Loop expressway that you can see curving around downtown, east to Washington, which is the north/south street a block to the left of the red dot. It would have been about three blocks long east/west, and about two blocks wide, north/south. 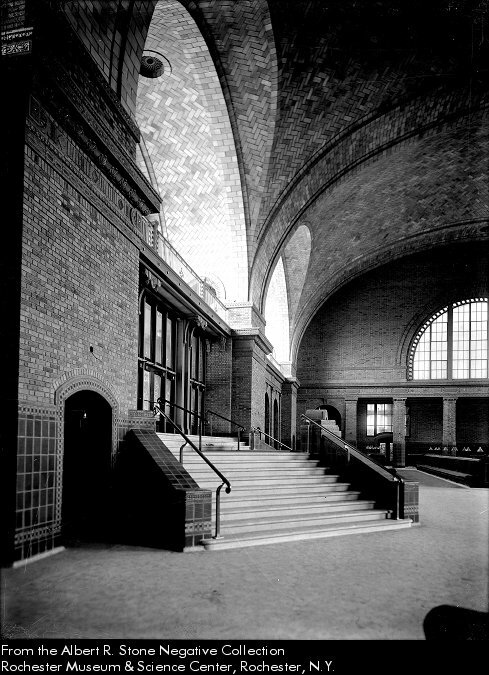 City Hall today remains in a Richardsonian Romanesque building at Fitzhugh and Church Streets, about three blocks north and east of the proposed Civic Center. This part of downtown is pretty sparse these days, as you can see. There’s nothing here except surface parking lots. 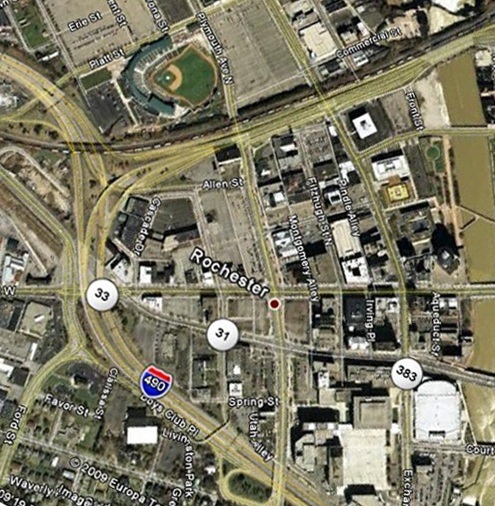 Best part: the Red Wings baseball stadium just the other side of the moat, um, I mean the expressway. 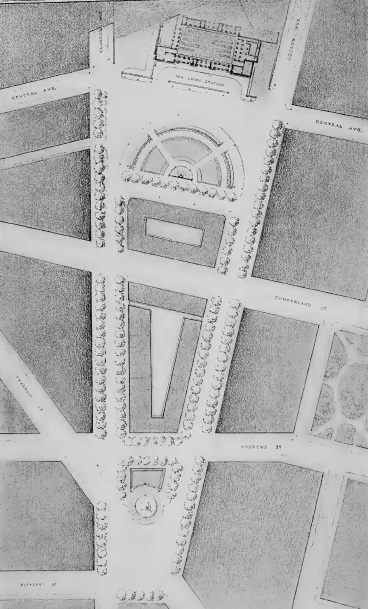 The station backs up to the raised railroad embankment, and enfronts a large plaza with semicircular parterres. Access is along either Clinton or Joseph, which have been turned into tree-lined parkways. As Clinton and Joseph converge at Pleasant Street, another plaza is created, which features a large round area for a fountain or monument. 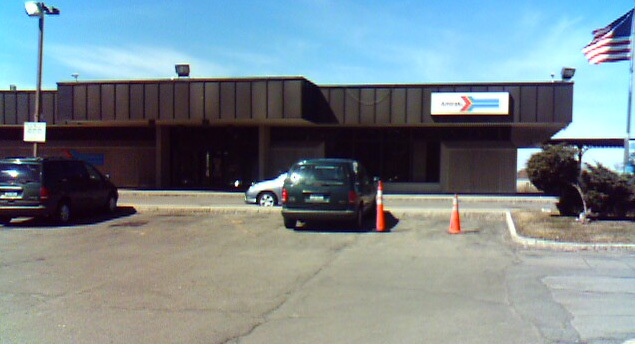 This second plaza is an urban signal of the presence of the station, and a gateway to or from the station. 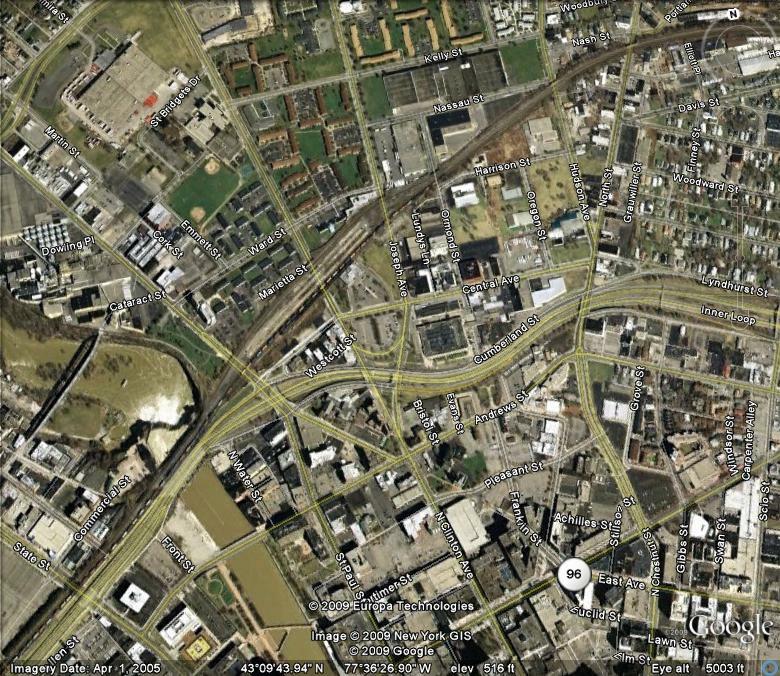 There is a pretty nasty looking brick station and lots of surface parking. No plaza – just parking lots. And the second plaza, at Joseph, Clinton and Pleasant, falls smack dab in the middle of moat/Inner Loop. Amy remembers this building vividly. The interior was quite gorgeous, with fabulous masonry and tile work throughout. 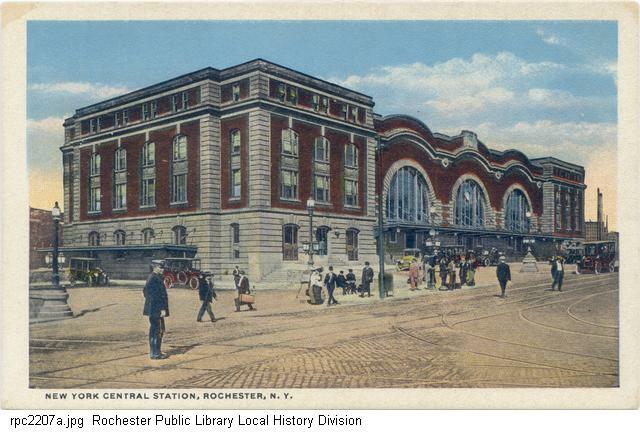 The public library here says that losing the Bragdon station was “arguably one of the greatest losses to Rochester’s architectural scenery and history.” No argument there. Rochester, like nearly every other American city, engaged in a decades-long gala festival of horrific urban decisions in the late 20th century. Time and again pretty much everything one could do to wreck a place, and employ the worst kind of city making, Rochesterians succeeded in accomplishing. What’s interesting is that underneath all that horror are a few pretty terrific ideas, other ideas about city making that could perhaps represent some of the necessary new foundations for the next Rochester. 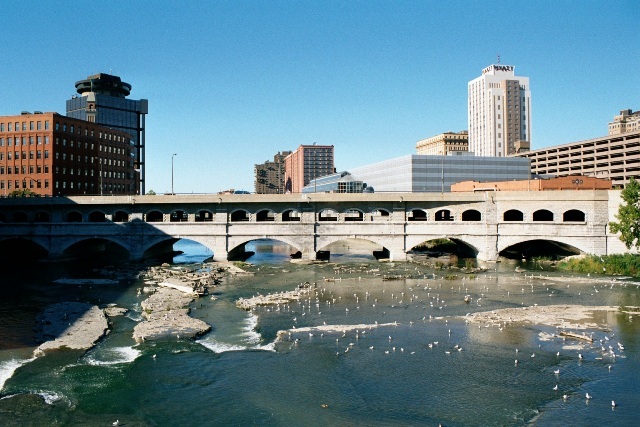 Rochester and its river, the Genesee. What better way to get to know a new home place than to imagine it as a case study for examining the next city? Here we are in our new neighborhood, and in between fresh paint, endless trips to the hardware store, and nearly daily (but very enjoyable) snow shoveling, I am spending time getting to know how Rochester got to be the city we inhabit today. I do this in the hope that I can use Rochester as a kind of object lesson in how our cities can make themselves into fit and durable communities for the future. It’s going to take a while to figure this one out. Every day brings new discoveries. I have learned the very hard way that only by understanding a city’s past can one speculate about a useful future. And so I have been trying to mine the rich history of this place, trying to understand some of the layers of now vanished Rochesters that have been the progenitors of the city we inhabit today. Every city disappears every day. What was is gone in an instant, replaced by some new place, altered to fit new circumstances and needs. The bank building at the corner a few blocks away (I think it was a bank building – maybe it was an office building – but it looked like it was about 25 or 30 years old), with its attached multistory parking garage, has mostly vanished since we arrived. We’re not sure what comes next, or why, but that urban fragment is gone, and with it one version of this entire place. So here are some early thoughts, observations, and discoveries. 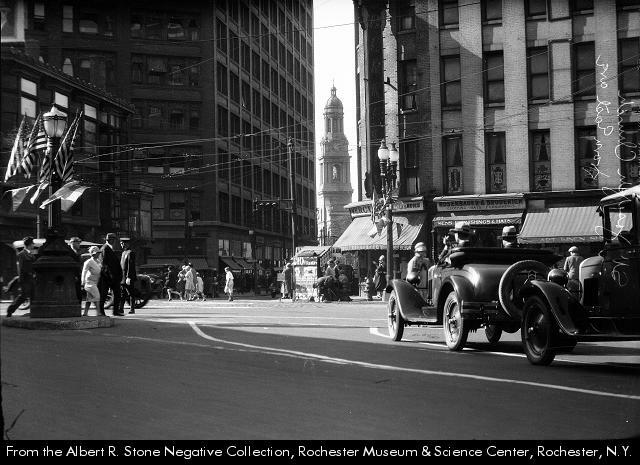 As a kind of urbanism, Rochester is as dominated by the automobile as any you know or could imagine. The city of about 210,000, and the region of about 1.1 million, is filled with evidence of sprawl everywhere you go. Downtown has almost no retail, though it was all there once, and almost nothing else, either. Offices for Kodak and Xerox, lots of surface parking lots, but none of the bustling activity that was once daily life. 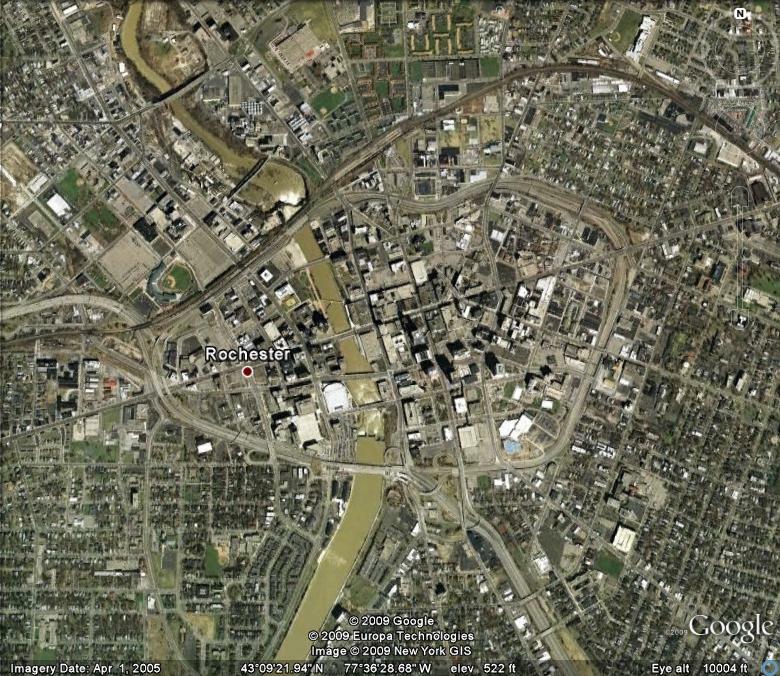 Four big shopping malls, one out in each quadrant of the region, replace what was once all centralized downtown. It’s easy to see the rail line, in the same place in this map of the region created in 1912 as in the shot from Goggle Earth. But even more interesting is another discovery. 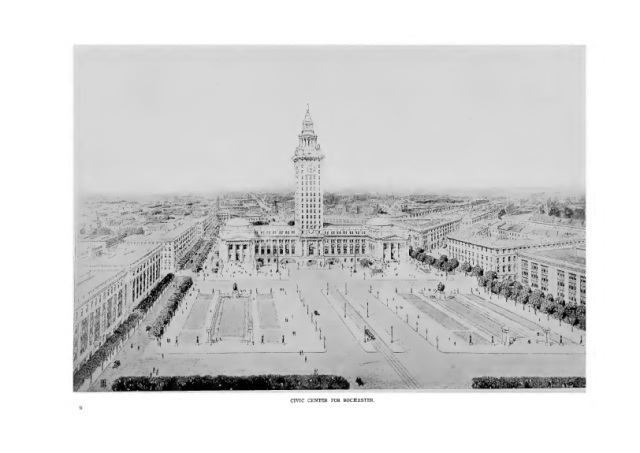 In 1911, the Rochester Civic Improvement Committee commissioned Arnold Brunner (who worked with Daniel Burnham on the 1903 “Group Plan” for Cleveland, and sat with Burnham on Washington, D.C.’s Commission of Fine Arts), and Frederick Law Olmsted Jr. (whose father was so instrumental in creating Central Park and the 1893 World’s Columbian Exposition. 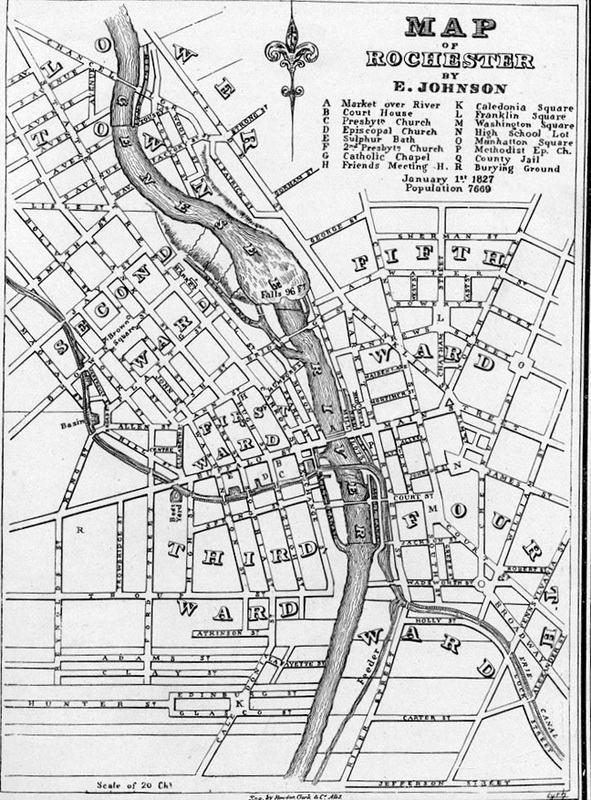 Rick, as he was known, worked very closely with Burnham in Washington, and probably needs other introduction), along with rail transportation expert Bion Arnold to create a “City Plan for Rochester.” (An interesting side note: The Rochester Civic Improvement Committee was chaired in 1911 by James G. Cutler, who was both a very noted Rochester architect, and the City’s mayor from 1904 to 1907). This is where things start to get really interesting. 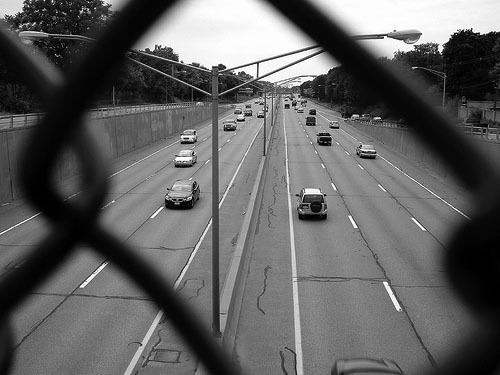 Olmsted’s and Brunner’s greenways are now almost all expressways. The late 20th century expressway system was founded on abandoned railroad rights of way, proposed but never realized greenways, or the alignment of the old Erie Canal, which was replaced by the Erie Barge Canal not long after the 1911 plan. Just one example: the greenway running east and west just north of downtown, between the Genesee River on the west and Irondequoit Bay on the east, is the precise alignment of the Keeler Expressway, local route 104, built in the 1960s and 70s. I guess it will take a while to peel this particular onion….